A fun and uplifting blog for those with a creative spirit and a desire to be better. I know, it has been quite a while. Life has been totally amazing and I have been enjoying time with my family and enjoying my time being creative. 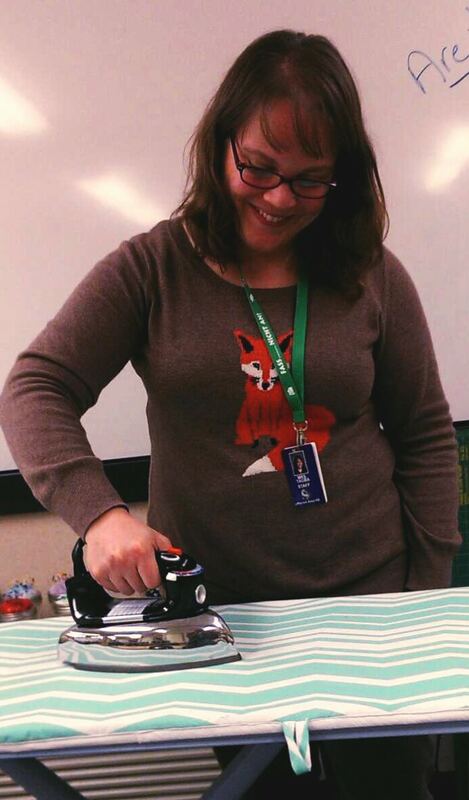 Of course, I am also still teaching high school FCS, too. It all keeps me busy, but the time has come where my kids don't need me as much and there is a little more time for myself. I've been sewing and knitting and have even found time to fill up my Etsy shop with new project bags, lanyards, key fobs, fabric baskets, and some amazing hip bags! I have also found a new love for photography and video. I am learning lots of new things about the previously mentioned things on Skillshare. I finally got up the courage to film my first ever online course, Pom Pom 101 which is now live on Skillshare!! 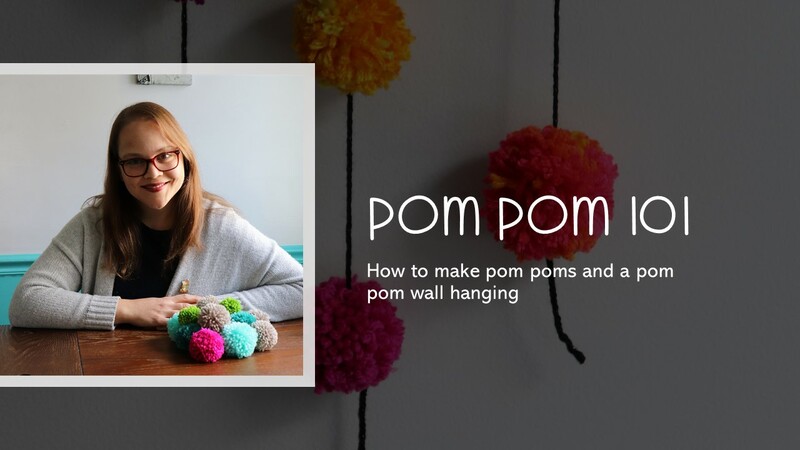 In this class I teach how to make pom poms and how to make a super cute wall hanging from the pom poms. My lighting and editing most likely could use some work, but as usual, I am probably my own biggest critic. I am thrilled with my end result. Please take a moment to check it out! I'd love to know what you think of it. If you click my link, you will get two months of Skillshare for free. You can totally learn a lot in those two months. There is something for everyone, but be sure to watch my class and upload a project. I can't wait to see what you make! It's been a whirlwind of activity around here with the end of the school year in sight. I did manage to find some time to make a drawstring project bag for my aunt as a gift for Mother's Day. She really does a lot for our family, taking care of my grandmother and she deserves a special gift. She loves to knit and goes to a class each Monday. This bag will be a great carry-all for all of her knitting needs. I had originally made my Tell Me a Story kitty quilt block for the #blackandwhitequiltswap, but changed my mind because the splash of color was a little too much. I used Jeni Baker's drawstring bag tutorial to make the bag. I use this tutorial with my students as their first project so they have a place to keep all of their sewing stuff. For the time being I am displaced in a trailer. The school is being renovated and I have very little storage space and the bags are quite handy. This semester we put the bags in the display case outside of the principal's office. I had so many compliments on the bags from other teachers and students. I feel so blessed to be able to share sewing with my students. Some of them have even gone out and bought their own sewing machines since taking my class! I even ran into some of them at the Quilt Guild's annual show. Bonus points!! For the bottom of the bag, I chose to use some black vinyl to give the bag a little more durability. If my aunt wants to keep the yarn in the bag as she knits, it will stand up a bit easier. I love how the bag turned out! Yesterday was such a beautiful day! I filled it with the things I love the most...family, sewing and being outside. Working on some new landscaping...it was a jungle out there. New house project number 101...getting ready to put up a new privacy fence. The work is never ending! My older crew hit the creek banks in the morning, ushering in the first day of fishing season and I took Malcolm with me to complete some errands before his second indoor soccer game of the season. Part of my job as the FACS teacher is taking sewing machines for repair and picking them up, so I lugged three machines back to my van and made a few more stops before going to my LQS. I was searching for some Robert Kaufman Architextures Crosshatch fabric for a special project, but had no luck. Instead, Malcolm found a kit for a cute soccer themed sausage pillow case. I thought, why not! 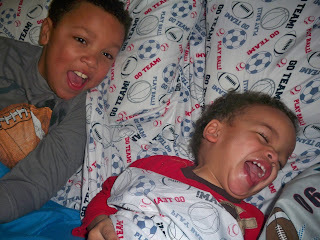 After sitting down around 8:45 PM, we had a pillow case about 20 minutes later. He loves it! Unfortunately, the pictures where he looked enthusiastic about it were too blurry from all of the excitement. This pillowcase is actually a project that the students in my school district do in 8th grade. Most of them tell me that they still use them when they get to my class at the high school. I really love this project because it can be personalized to fit anyone. I think I will be making these for kiddo birthday parties this year. Anyway, I was looking for the Crosshatch fabric to tie my blocks together for the #TellMeAStoryQuilt sew-along over at During Quiet Time. Amy's new book Intentional Piecing is stunning! You should definitely pop over to her blog and check it out! My first and favorite block so far! Coffee is the story of my life! These paper-pieced blocks come together so quickly and they are really fun to look at and to make. I have been admiring all of the blocks that have been posted on Instagram. So much talent out there!! A snowy Sunday in spring... Lesson plans were done for the coming week and then I took some time to do a little stitching. I stitched out this awesome embroidery a while back. I love the message! It is an Urban Threads design. I LOVE their embroidery designs!! There are so many cool designs to choose from! This particular design reminds me a little of my students. Back when I taught German I had mostly male students. Now I have a lot more female students with my new job in FCS. After listening to some of the things my girls deal with, I hope they can take that message to heart and realize that they need to be happy from within before someone else can contribute to their happiness. Originally I had planned to make a zipper pouch out of it. I looked at it today and thought I would make a drawstring bag with the pink fabric around the top and for the lining, but sadly I realized I didn't have enough denim to do that. So, I came up with a bucket tote instead. I had my heart set on using a bright yellow zipper to make a pocket on the outside of the drawstring bag, but since that just wasn't to be I still used the yellow zipper as the handles of the tote. I really love how it turned out. Not too bad for not having a pattern. I put a layer of fusible fleece behind the denim to help it keep it's shape. I love how my yarn fits in it nicely. It'll be a great little project basket. Maybe I should set it on my desk at school for a little while. So, it has been quite a while since I've sat down to post something substantial. I promise I haven't been sitting around being lazy...quite the contrary. For the past two years I have been adjusting to my new role as the Family and Consumer Sciences teacher at my high school. German was phased out and as sad as that is, I am so lucky to have been given the chance to teach yet another subject that I LOVE!! I actually get paid to teach kids how to sew, cook, live a productive life and be good parents. It doesn't get much better than that! It surely has been keeping me busy. It's kind of like having a whole other house and family. I'll talk more about that in a different post. I missed blogging and making stuff that didn't pertain to school, so I recently had the genius idea (haha!) to combine the two. My blog will still be my creative space, but maybe with a slightly different focus. I can't wait to give you a glimpse into the day in the life of the Home Ec teacher! I can show you all what I am doing with my students in class and hopefully as I learn the tricks of my new trade, I will have more time to sew things that aren't for school, too, that I can share. Sewing still remains my passion! I have done a little sewing for a local craft fair and I just joined the #blackandwhitequiltswap on Instagram. That is the first sewing swap that I've done in years. I'm so excited to start! It feels so good to get back to what I love to do! I hope you'll continue to follow along with me on my journey. I have missed my blogging community though! 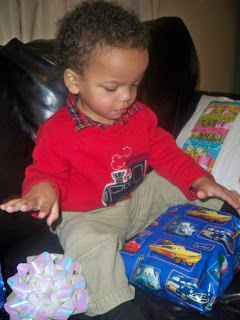 Look who turned two yesterday! Sweet Baby M! I guess he is actually no longer a baby, is he? How time flies! Here are a few recent photos of the boys. 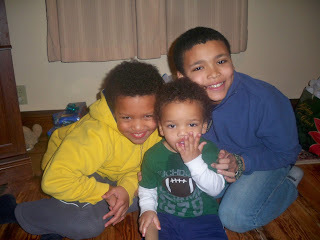 I can't believe how they have grown this year! I am now eye-to-eye with my 11 year old! Peek-a-boo under the covers- Baby M's favorite game! He laughs every time! 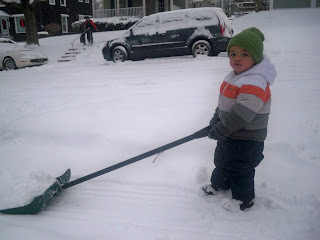 Daddy's little snow shoveler! There sure has been lots of snow to shovel! 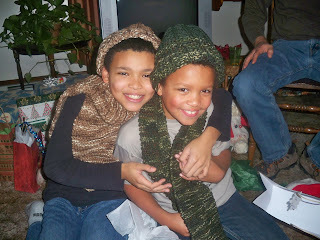 New hats and scarves knitted by Aunt Cindy! Thank you! My three sweethearts! Baby M is blowing a kiss your way! I hope you have all enjoyed the holidays and are looking forward to a terrific 2013. Do you have any fun resolutions for the New Year? I think I should make one to post on this blog once a week! I have really missed it, but just haven't had much spare time. Believe it or not, these boys are pretty busy! From our house to yours, Happy New Year! May this be the best year yet! !